A fruit is the seed-containing part of a plant. If you want to get all botany-nerdy, a fruit is the fleshy or dry ripened ovary of a plant. Fruits are not only delicious but healthful too. Rich in vitamins A and C, plus folate and other essential nutrients, they may help prevent heart disease and stroke, control blood pressure and cholesterol, prevent some types of cancer and guard against vision loss. minerals , which are essential for proper functioning of the body. Rich in dietary fiber also with vitamin D which helps protect bones and muscles(click here to read more on how vitamin D protect against heart failure);fruits also help to improve the functioning of the digestive tract. Fruits are an important part of a healthy diet for those who want to lose weight; they give ample energy and nearly every nutrient that your body needs to curb weight gain, without adding any unnecessary fats. All fruits offer health benefits, but the following 10 stand out as nutrient-dense powerhouses with the most disease-fighting potential. 1.Apple:Apples contain antioxidants called flavonoids, which may help lower the chance of developing diabetes and asthma. Apples are also a natural mouth freshener and clean your teeth with each crunchy bite. • Did you know? An apple's flavour and aroma comes from fragrance cells in apple skin, so for maximum flavour, don't peel your apple. Plus, the vitamins lie just beneath the skin. 2.Pears: Another beneficial fruit is the pear , which is a good source of fiber, vitamin C , B2, E, copper , and potassium. Pears are an excellent source of pectin and fiber that effectively lowers cholesterol levels . It is mostly prescribed for infants as it is believed to be fruits that is completely safe for young children to ingest. 3.Mangoes: Mangoes are rich in beta-carotene. Papayas act as powerful antioxidants with an abundance of vitamin C, vitamin E , vitamin D and vitamin A that aid in the oxidation of LDL cholesterol. This prevents the formation of dangerous plaque that can result in atherosclerosis , heart attacks, or strokes. You get good amounts of vitamin C from papayas, oranges, guavas and Indian gooseberries. 4.Grape:Grapes contain resveratrol, an antioxidant that may help prevent heart disease by reducing blood pressure levels and lowering the risk of blood clots. Resveratrol may also help stop the spread of breast, stomach and colon cancer cells. • Did you know? You can freeze red and green grapes and use them as colourful ice cubes in your favourite drinks. They add a special touch to sparkling water or Champagne. 5.Orange:Oranges are a good source of folate, an important vitamin for pregnant women that can help prevent neural tube defects in their infants. They also contain a phytochemical called hesperidin, which may lower triglyceride and blood cholesterol levels. • Did you know? The edible white part of the orange rind has nearly the same amount of vitamin C as the flesh, so eat that part too! 6.Tomatoes: You might be surprised to know that tomatoes are actually fruits and not vegetables, although we typically consider it as one of the latter. Tomatoes have a high vitamin content and they are excellent blood cleansers. 7.Berries: Blueberries , cherries , and blackberries prevent cancer and keep your heart protected. If you include cherries or cherry juice in your diet, you can eliminate the associated pain from arthritis , gout and joint inflammation. Berries have the capability of curing arthritis naturally. Blueberries with high silicon content, aid in the functioning of the pancreas and is good for diabetic conditions. Blackberries can naturally control diarrhea and form new blood cells, but excessive intake can also have an adverse reaction resulting in promoting constipation. If you mix blackberries with cherries or prune juice, it will prevent the possibility of constipation. High sodium and potassium content in gooseberries and huckleberries protect the liver and intestinal tract. 8.Pineapple:Pineapple contains a natural enzyme called bromelain, which breaks down protein and helps aid digestion. Bromelain may also help prevent blood clots, inhibit growth of cancer cells and speed wound healing. • Did you know? Since bromelain breaks down protein, pineapple juice makes an excellent marinade and tenderizer for meat. 9.Watermelon:Watermelon is 92 per cent water, making it aptly named. It's a great addition to any weight-loss diet because it is low in calories and satisfies the sweet tooth. • Did you know? Watermelon rinds and seeds are both edible. Roasted, seasoned seeds make a great snack food, and the juicy rind can be stir-fried, stewed, or pickled. 10.Avocados contain healthy mono unsaturated fats that can help lower cholesterol levels when eaten instead of harmful saturated fats. For a heart-healthy boost, replace butter with avocado on your favourite sandwich. • Did you know? Babies love avocados. Their soft, creamy texture makes them easy to eat, and their high fat content helps with normal infant growth and development. Did you ever wonder which form of fruit gives you more nutrition – whole fruits or fruit juices? It is actually difficult to say which one gives more nutrition. Although eating whole fruit is considered to be the best way of attaining the full benefits of fruits, fruit juices are also easy and healthy options. Of course, if the fruit juice is composed of 100% fruit without extra preservatives or additives, then it has the same nutritional value. You have probably come across the term “seasonal fruits”, and as a matter of fact, most fruits are considered seasonal. They grow in a particular season depending on their native geography and climate. You may be able to get these fruits throughout the year, but they have usually been in a frozen state for a varying amount of time. Eating seasonal fruits during the season ensures that they are fresh. Furthermore, most seasonal fruits can also ward off the disorders that come with the season. For example, in India , green mangoes are quite useful for dealing with the heat of summer. Including seasonal fruits in your diet is a delicious and natural way to stay healthy!!! The benefit of Eating a Lot of fruits? The vitamins, minerals and antioxidants in fruit may help keep your heart healthy so you can reduce your risk of problems as you get older. Walter Willett reports in his book "Eat, Drink and Be Healthy: The Harvard Medical School Guide to Eating Healthy" that individuals who eat five servings of fruits or vegetables are 15 percent less likely to have a heart attack. Fruit may also promote the healthy circulation of your blood, which also reduces your risk of heart disease. Willett adds that citrus fruits, such as oranges and grapefruit, may be particularly beneficial at reducing your risk of heart disease. diabetes affects many people and is characterized by an inability to use insulin the proper way or your body not being able to produce sufficient amounts of insulin. Type 2 diabetes can be life-threatening if not diagnosed and treated.we notes that eating a diet rich in fruit may reduce your risk of developing diabetes. Fruit contains many different nutrients that your body needs to maintain your health and eating several servings a day may cut your risk by providing you with the vitamins and minerals you need. The protective benefits that the vitamins, minerals and antioxidants in fruits offer span many different medical conditions that can decrease your health and quality of life. GodzGeneral notes that the potassium in fruit may reduce your chances of developing kidney stones and may help prevent bone loss. A diet rich in fruit can also help lower your blood pressure and cholesterol levels. It’s advised to eat fruits in the whole form, including their skin if it is edible, in order to gain the benefits of high fibrous content present in them. This promotes healthy digestion and prevents constipation. 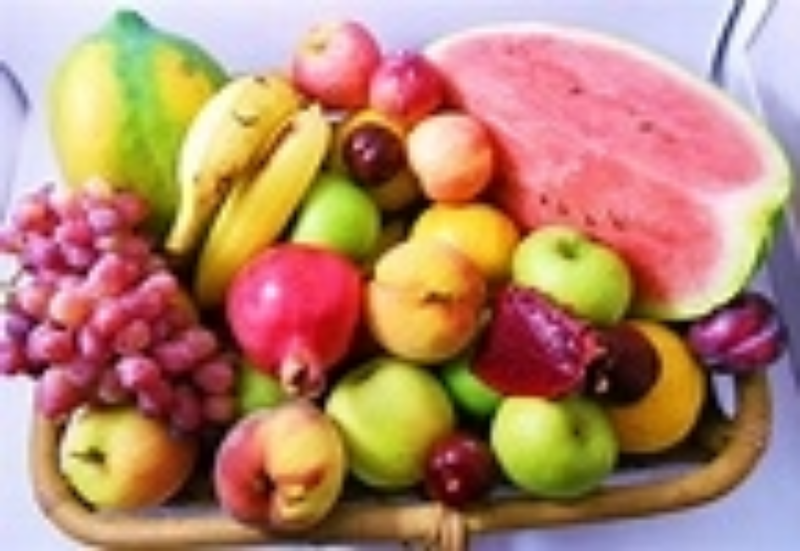 The maximum nutritional value in fruits can be derived when eaten raw. Cooked or preserved fruits usually lose some of their important nutrients due to high heat and extended shelf life, respectively. Thus, fresh fruits are the most advantageous for your diet. Never eat fruits along with your main meal; this can result in severe acidity and digestive problem because fruits are usually mildly acidic in nature. Always eat fruits before or after your meals, leaving an hour or two of separation. It is always recommended to eat fruit on an empty stomach, or at least after a relatively light meal. Fruits on an empty stomach help to delay graying of hair, nervous outbursts, dark circles under the eyes, and balding. Never drink water immediately after having fruits as it can result in high acidity. Fruits should be eaten in the morning, as this helps in detoxification and also aids in weight loss . Although these benefits can be gained by eating fruits at any time during the day, morning is said to be the ideal time for them to have their greatest effect. Try not to keep fruits in very hot or very cold places, this reduces their shelf life – a moderate, dry, cool temperature is suggested for storage.